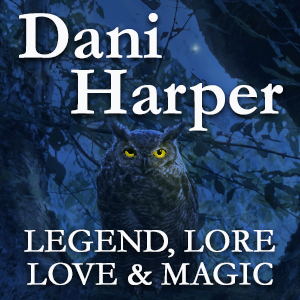 This morning, in our book spotlight, we are featuring the latest book in Dani Harper's The Grim Series. 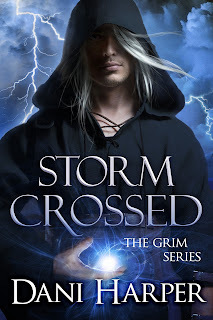 Check out Storm Crossed, learn about the author and enter for a chance to win a Kindle Fire HD in the book tour giveaway at the end of this post! He kissed her before she could laugh at him. Lissy pulled away and laughed anyway. She kissed his forehead and headed to the house. Sunlight brightened her long dark curls, and she was always pleasing to gaze upon, but he found himself thinking of another Lissy, the one revealed by firelight. Glints of gold were unveiled in her hair and eyes, and the flames’ glow warmed her naked skin to honeyed mead. His body stirred anew at the very thought, and he sighed aloud. The first time they had come together as lovers, he’d been undone by the unexpected tenderness, the way she generously gave of herself. Hers was not the artful stroke or the trained caress traded for the same. Instead, she seemed to put her entire self into the act, withholding nothing—wholly, gloriously present. For no good reason, Trahern looked at his hands, as if they might belong to someone else, as if he were someone else. Perhaps he was. Had he not changed, slowly but surely, ever since Lissy Santiago-Callahan had confronted him at Palouse Falls? Perhaps his brother had been right all along. Perhaps love did exist. But surely he had not succumbed to it. Indeed, he was still very certain he could not love. Lissy believed that he did, but his feelings for old Heddwen were no more than fondness. Not love. And although he wanted no other woman but Lissy, it was simply affection, was it not? Braith had paid a heavy price for his love of Saffir. If Trahern also yielded to love’s siren call, disaster would surely follow. Love leads to ruin. Who would watch over Braith then? Teach Fox? Worst of all, what would happen to Lissy? He’d revealed his past to her with a touch. He hadn’t told her that the veil over her own past had been drawn back as well. The grief she’d experienced over the sudden death of Matt Lovell had been wild, soul-scorching, and raw. If we continue on this present path, will I cause her heart to sunder anew? Where is your favorite place that you have lived? That's a tough one. I miss the Peace River country of northern Canada, but I came to love the grandeur of Alaska - both land and sea. How many gnomes do you have? It all started with one... My mom gave me a gnome and I put it in the garden. I think he sent out invitations, because suddenly there were three. Then six. Then... Well, you get the idea. At the moment, I THINK there are 32. But I haven't counted lately. There might be more! Many of your characters have skill and abilitys, some magical some not. If you could have one of these abilities, which would it be? Part of me would like to be a member of the Wild Hunt, like Hyleath, and ride a fae horse unseen on the wind. The other part of me admires Lissy's geological expertise. I would sincerely like to study that field. I love this series. I'm enjoying the excerpts on the tour and look forward to reading Storm Crossed. Do you have a set schedule for your writing or do you just write whenever you have a free moment?